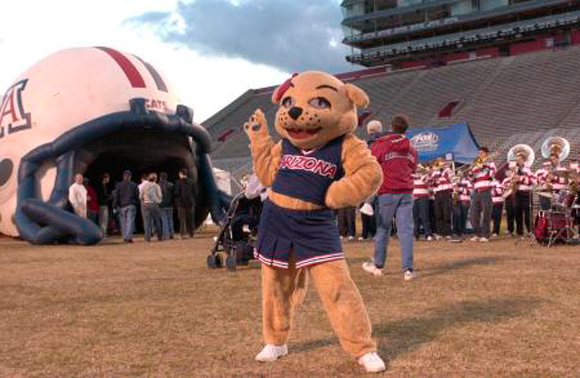 Born Friedman » UofA Baby! 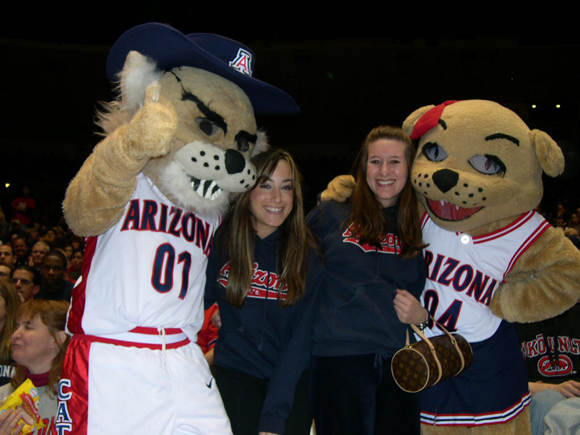 When it comes to colleges, Madelyn swings more Wildcat than Mustang. Her daddy is a Cal Poly alumni, and while we love everything about San Luis Obispo and the drive (wineries!) 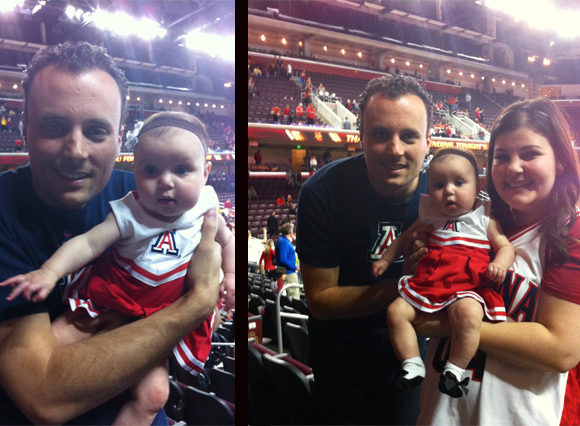 up there, if Madelyn’s going to be a legacy of a university, it’s going to be Arizona. First and foremost, there’s no AEPhi at Cal Poly, so that’s a done deal. 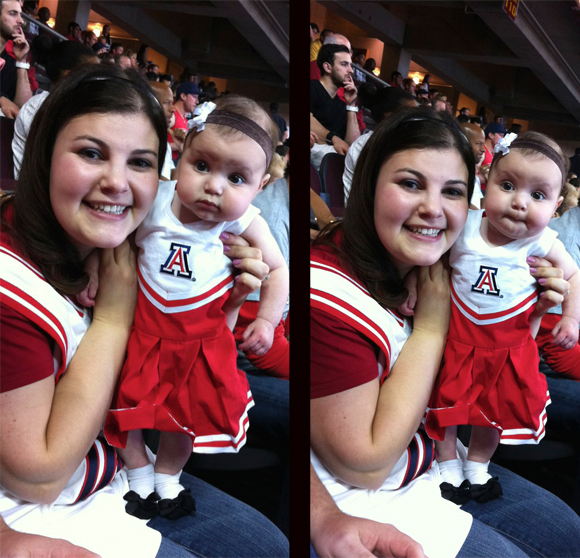 But also, Madelyn makes the most adorable cheerleader and UofA is all about athletics. 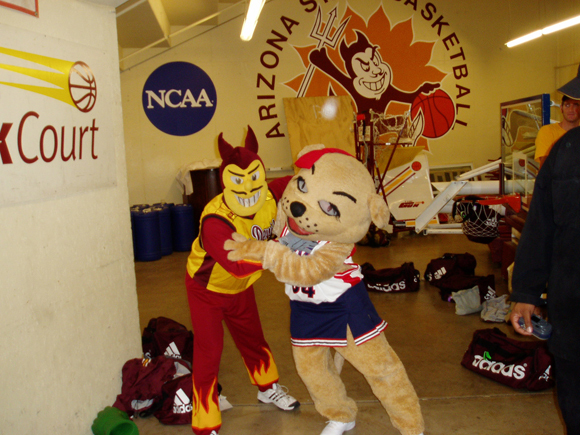 I had so much fun going to football and basketball games — whether in human or Wilma Wildcat form. 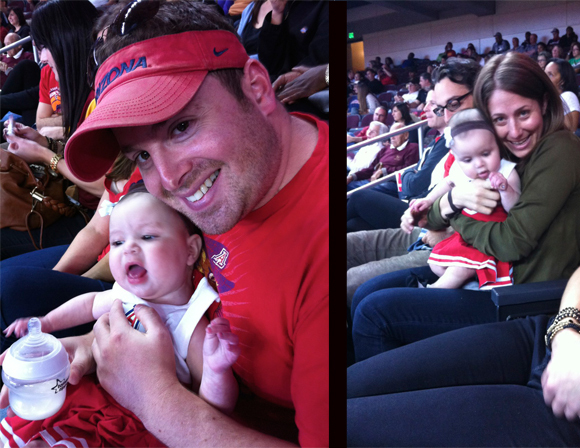 So naturally, I was kvelling a few months ago when we took Madelyn to her first college basketball game: Wildcats vs. Trojans at USC. We met up with our friends in the valley and carpooled to USC together where I debated on and off whether to take the stroller with me. “BUT IF I LEAVE IT UP ON THE CONCOURSE, WON’T IT GET STOLEN BECAUSE WE’RE IN THE GHETTO, OHMYGOSH!! 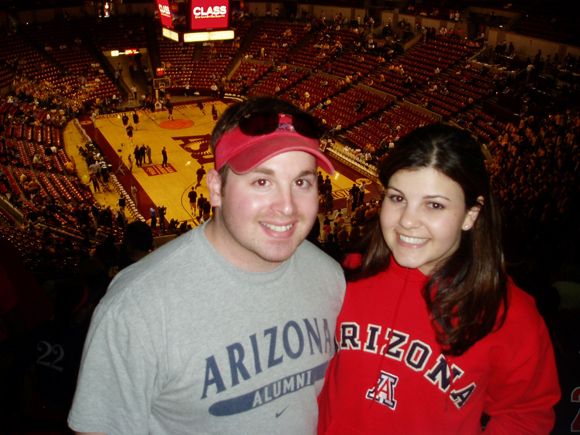 !” I took it with me, and lo and behold, none of the accomplished and affluent USC fans were interested in my $60 Snap N Go that sweetly rested at the Galen Center. What? My cheap stroller frame isn’t good enough for you??????? During the game, Madelyn watched in awe of the boys who moved the big orange ball back and forth. 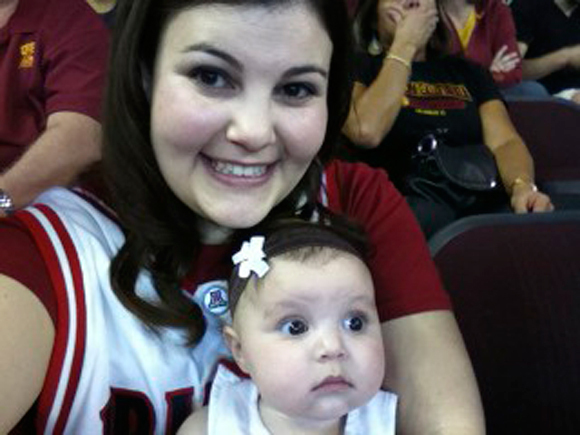 She loved watching the videos on the big screen and wasn’t bothered at all by the sounds of cheering and buzzers. Our friends helped us out during the game when we needed free hands to make bottles or reach for a toy. She tried to eat our chicken fingers and French fries, but told her that stadium food will have to wait. For now, there’s nothing like watching a game and throwing back a nice cold one. Of milk. 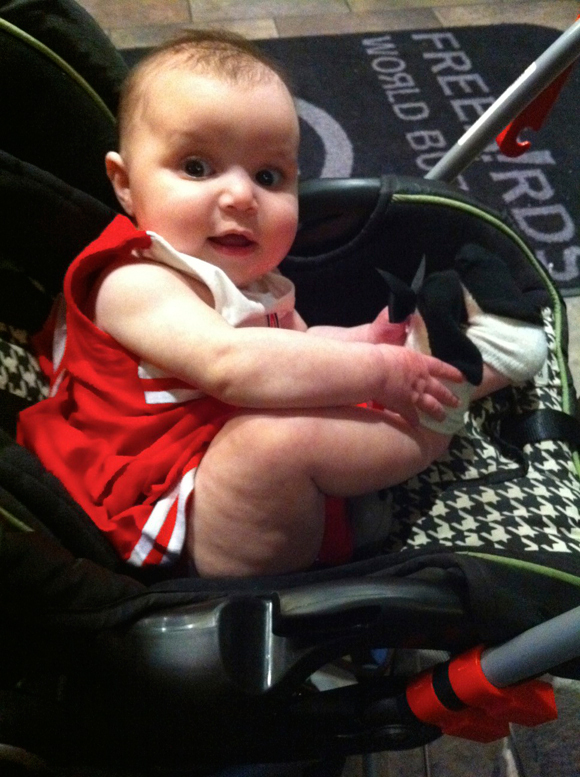 Most importantly, Madelyn is our good luck charm! The Cats beat the Trojans and now that the basketball season is over, I can probably say that that was the highlight of Wildcat basketball for 2012. We shall not speak of anything in the post season. After the game, our crew got a bite at Freebirds across the street. Burritos and a baby: does it get any better than that? So, Madelyn’s fate is sealed. 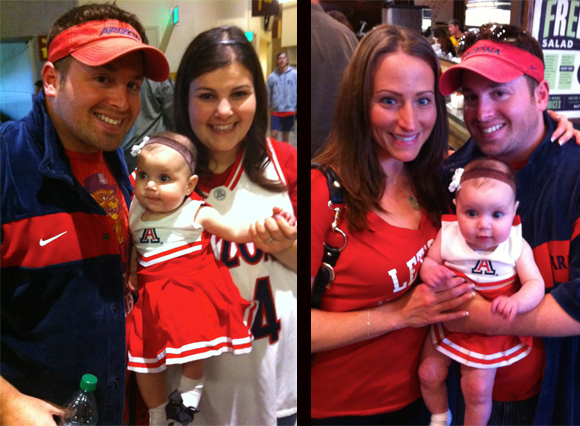 Dear University of Arizona Admissions: Though a half-breed of Mustang and Wildcat, our daughter is a Wildcat at heart and will be overjoyed to be part of the freshman class of 2029.